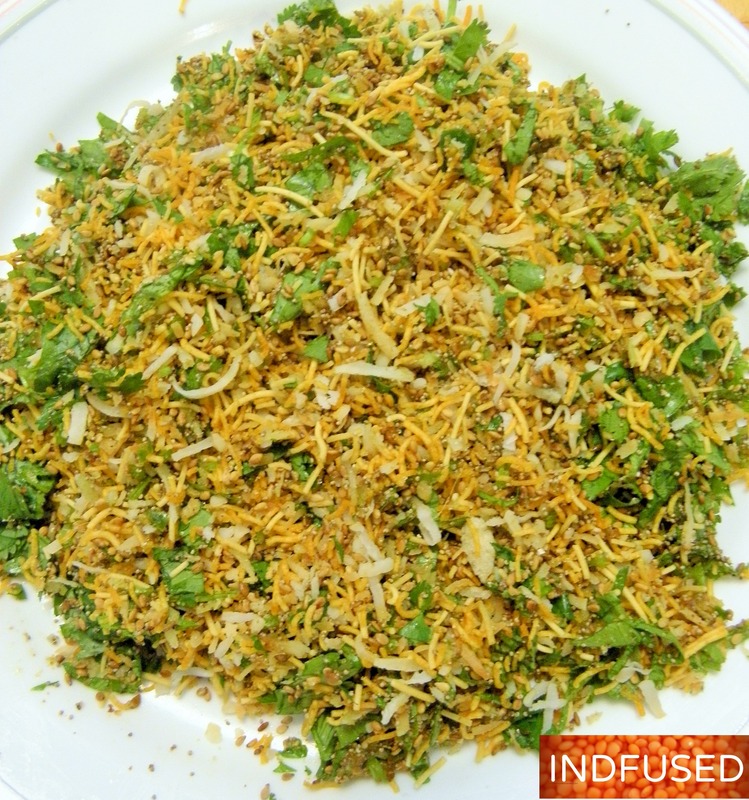 Bakarawadi can be labeled as the most addictive snack food of Maharashtra, India! It is a stuffed, savory roll that is deep fried. Here is my baked version that is sure to satisfy your craving for the famous Bakarwadi! There are two types of Bakarwadi in Maharashtra that are insanely popular. As far as I can remember, there have been people lined up outside the stores to buy them! Their popularity has not faded over the years. Of the two most popular ones, one is the bakarwadi from Pune and the other from Kolhapur. The covering made of besan or gram/chick pea flour is similar in both but each has a distinctive filling. 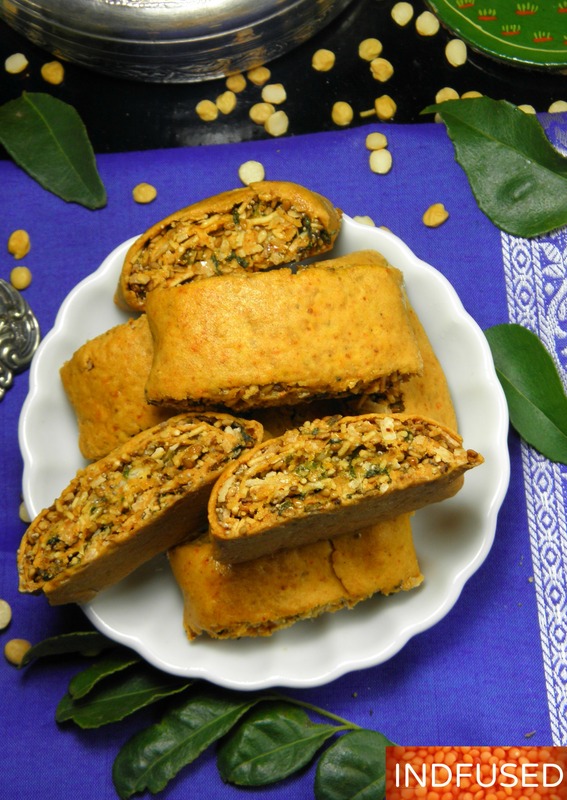 My recipe is to create a filling similar to the Chitale Bandhu bakarwadi in Pune. The added bonus is that I baked my bakarwadis so I can enjoy them guilt free 🙂 I have made them bigger in size an dare stuffed with the filling! Ingredients for the filling all ready! 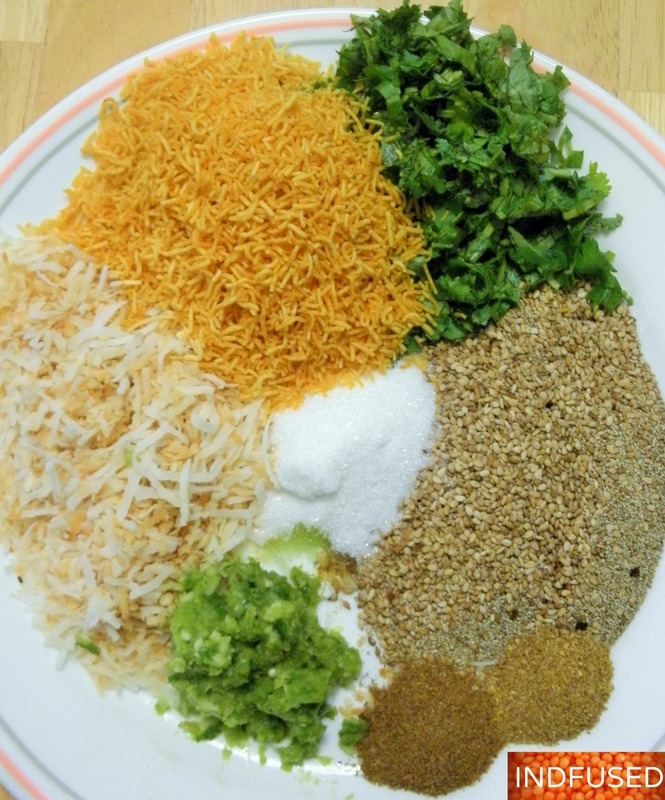 Mix together the ingredients for the filling! …..mmmm…..smells so good already! Then I made the dough. Dividing the dough into two parts, I rolled one part at a time, on a floured surface. It is important to roll the dough as thin as possible for this recipe. 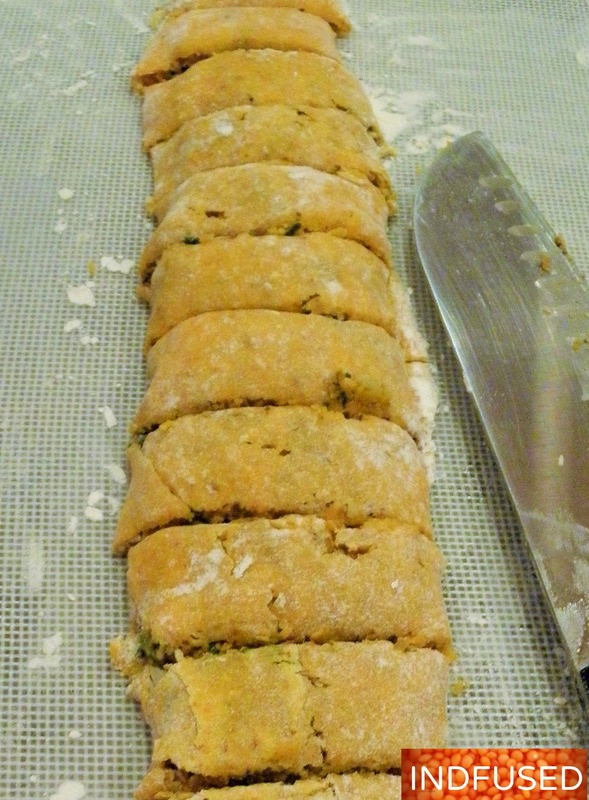 Spread ½ of the filling on the rolled out dough. 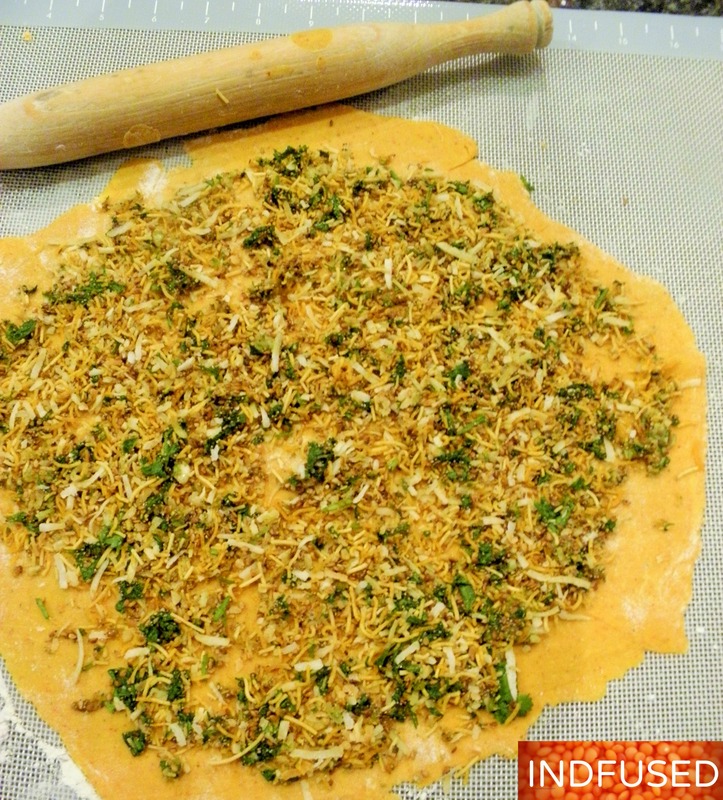 The filling is spread on top of the dough and then rolled up together. I rolled it tight in a jelly roll fashion and cut the roll in about ¾ inch wide pieces. I repeated the process with the other half of the dough and the filling. Dough rolled and cut for my big sized bakarwadis stuffed with the addictive filling! 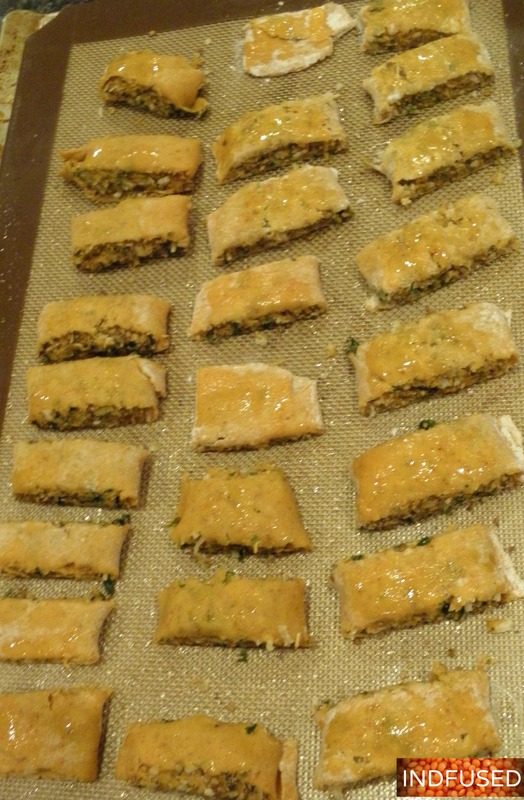 I placed them on a greased baking sheet and brushed the bakarwadi lightly with oil. Baked and ready to devour! About 1 ½~2 teaspoons oil for greasing the baking tray and for brushing the bakarwadis. Grind together in a paste, the green chilies, mint leaves, ginger and garlic. Mix with all the other ingredients of the filling. Set aside. Combine the dry ingredients for the dough. Add the oil and mix it in with your fingertips. Add enough water to form a ball for the dough. Divide in two parts. Preheat oven to 350 degrees. Roll out one part of the dough. The dough should be rolled as thin as possible. 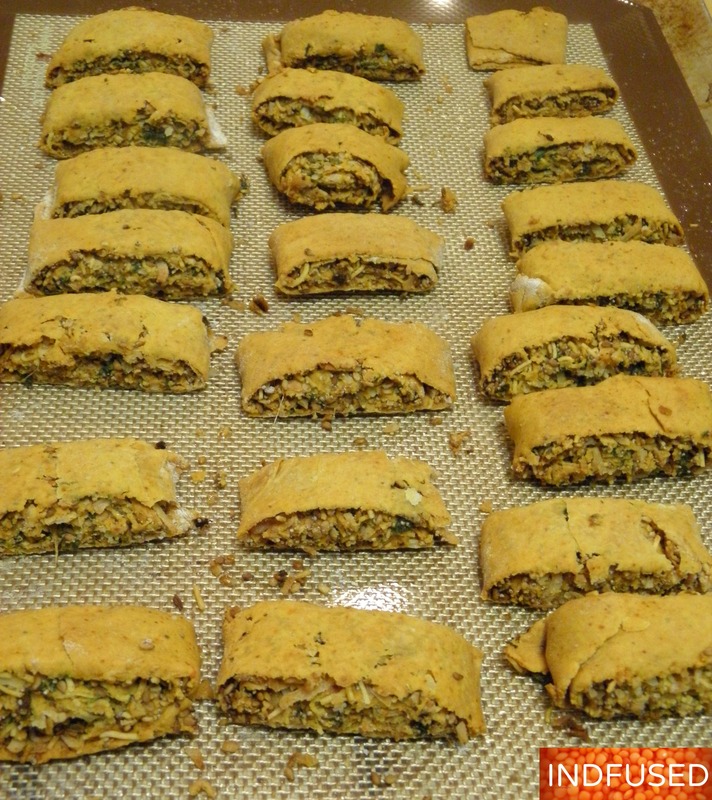 Spread ½ of the combined filling over it, leaving about ½ inch margin all around the edges. 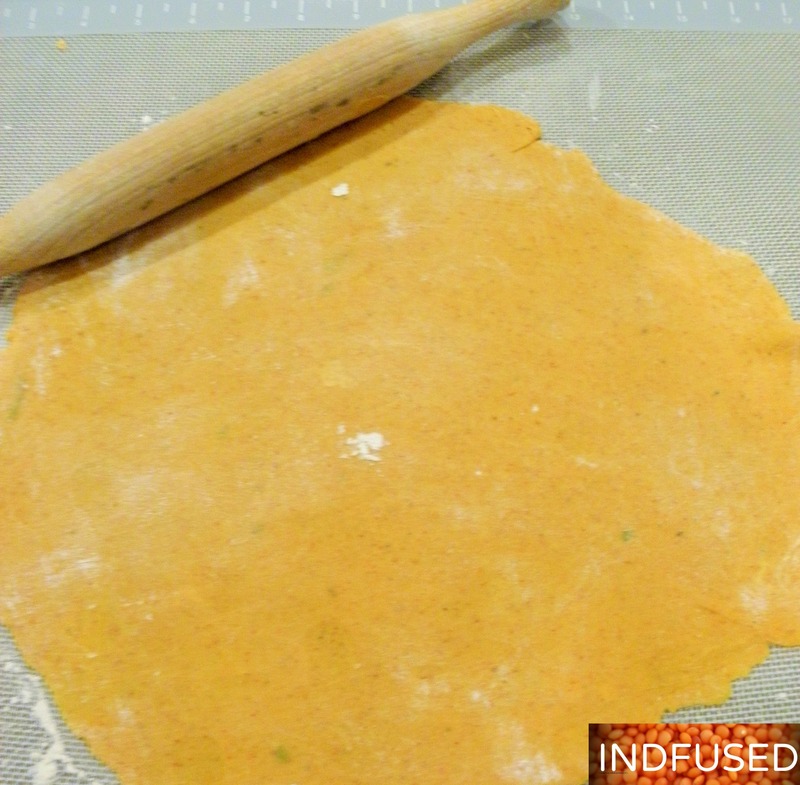 Roll the dough with filling in a jelly roll fashion, making sure it seals at the long edge. Cut the roll into pieces about ¾ inch wide. Transfer to a greased baking tray. Repeat with the other half of the dough and filling. Brush the tops of the cut pieces lightly with oil and bake for 30 minutes. Flip the bakarwadis upside down and bake for another 10 minutes to get an even color all around. Remove, let cool and store in an airtight container. Bakarwadis are ready to devour! Do let me know how you like this most popular, addictive snack in Maharashtra! I can imagine the flavors! I’ll have to look for the sev. Of course I have had it many times in chevda type mixtures but have never seen it packaged on its own. Thank you Greg! Sev i savailable in thick and thin varieties in packages. I get the thin ones that are not marked hot sev for the bakarwadi and chaat recipes, so I can add the chilies as I like them.I usually get the Masala Mirch brand as I have found it to be consistently good so far. Thank you so much Ronit! I don’t think I’ve heard of this before Sandhya, if I have, maybe I don’t remember it by that name?? I’m not too sure. It looks really good though, I like your step-by-step instructions and the first picture pops right out at you, very nice! Of course the baked version is always a bonus. Happy Diwali to you and your family. These look fantastic. Sev is now on my shopping list for my next trip to Toronto. Thank you Hilda. I used the thin sev for the bakarwadi. They come in thick and thin variety.I have found the Mirch Masala brand to be consistently good. I found the sev, then had to go back and get the thin variety. I just made a batch of these and they turned out excellent. I will be taking them to a potluck with me this evening. Thanks again for another new and excellent recipe. Hilda, I am so glad that you made it! do post a picture if you took one. Thank you Linda. Sev are noodles made out of chick pea flour and eaten as a snack. Amazing explanation.. It is so tempting. Love the flavors. I love the flavors Sandhya! What a great idea to make a baked version. They look amazing! Thank you so much Antonia! Sounds like the perfect thing to serve with tea or coffee, Sandhya. ♡ Maybe we will get together and enjoy?! Thank you so much! I like the Kolhapuri one also. This filling is more like the Pune one. Do let me now how you like it. Thanks for the recipe Sandhya. Tasted this on my recent Pune visit from Chitle. Loved the spicy taste with little sweetness. Now you posted it. What a coincidence. Loved you baked it instead of deep frying. Thanks for sharing dear. Timing is just perfect. I will try it and give you feedback. But I think you didn’t add sugar in it. How to get the mild sweat taste?